ScreenSteps Desktop 2.9 and Workgroup DocumentationScreenSteps Desktop & WorkgroupCreating Word Templates Working With Word TemplatesHow Do I Create A Lesson Template? 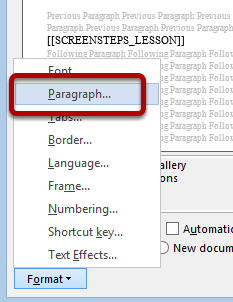 The only text you need to add to the document is [[SCREENSTEPS_LESSON]]. When exporting a lesson ScreenSteps will look for this text in the document and replace it with the lesson contents. Make sure that all styles are listed. Select All Styles from the Select styles to show: menu (1) and then click OK (2). 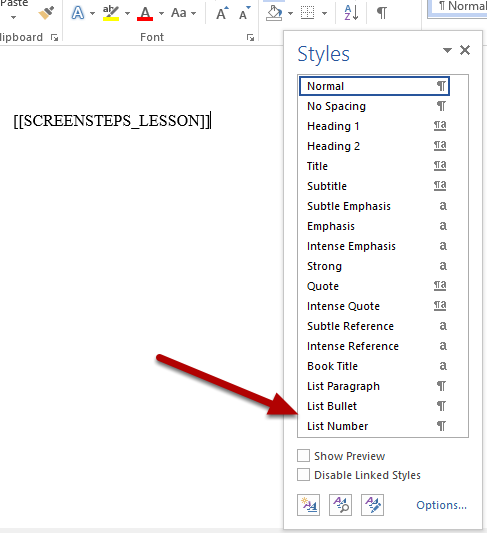 In order for lists to appear correctly in ScreenSteps output you need to make sure that the List Number and List Bullet styles are in the document. 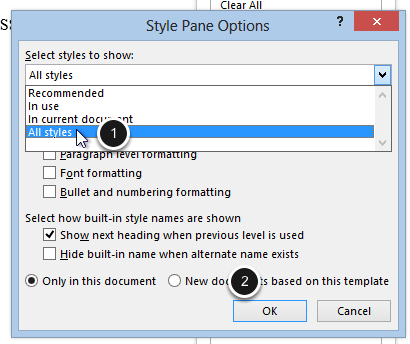 To add the styles insert a single numbered list line and a single bullet list line (1). 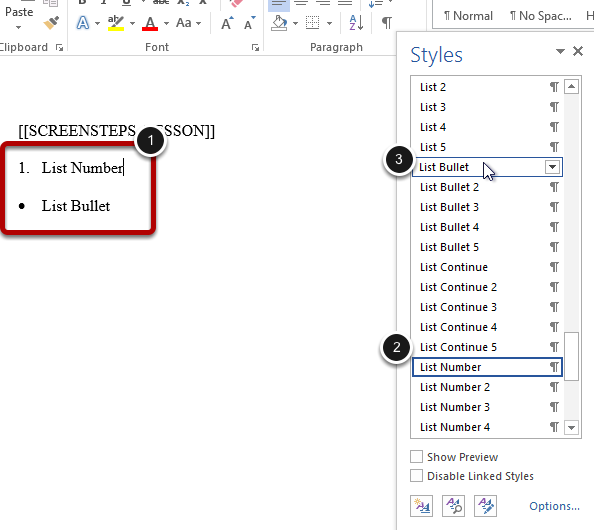 Next, select the numbered list line and select List Number as the styles (2) then do the same for List Bullet (3). 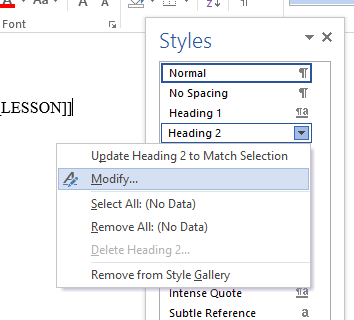 Now save the document so that the styles are saved with the document. Now you can delete the lists from the document. The List Bullet and List Number styles are still available in the document (the Styles list in this screenshot is being filtered by "In Use"). 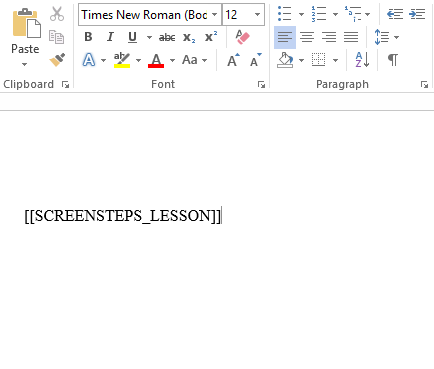 When ScreenSteps generates the DOCX file it applies styles to chapter titles, lesson titles, step titles, lesson descriptions, step instructions and step images. 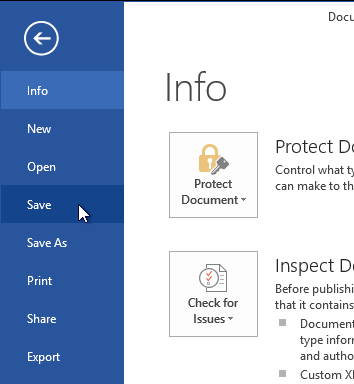 This makes it very easy to customize the look of your document. For Heading 1 you only need to click the OK button. 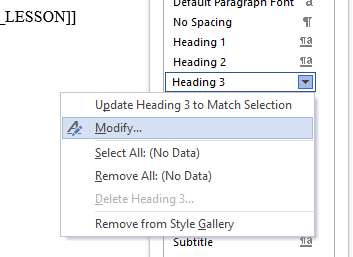 This operation adds Heading 1 to your document as a style. Modify the Heading 2 style and click OK.
Do the same for Heading 3. 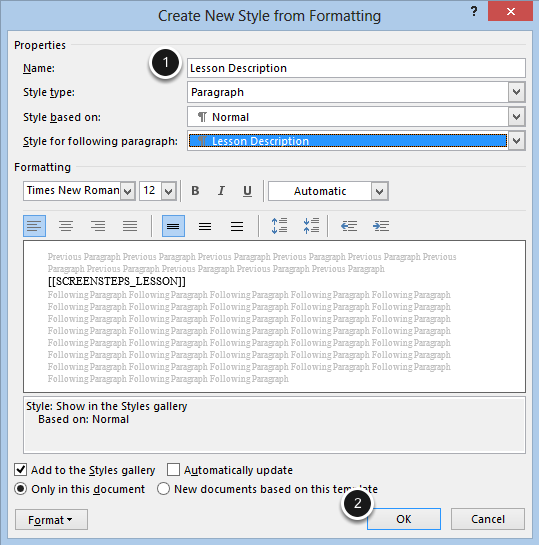 Now you need to add the styles for lesson descriptions, step instructions and step images. To being click the New Style button. Name this style Lesson Description (1). You don't need to change any other settings though you can if you want. Click OK (2). Repeat the same process for Step Instructions. The last style you need to create is Step Image. Use this style to add padding around your step images. 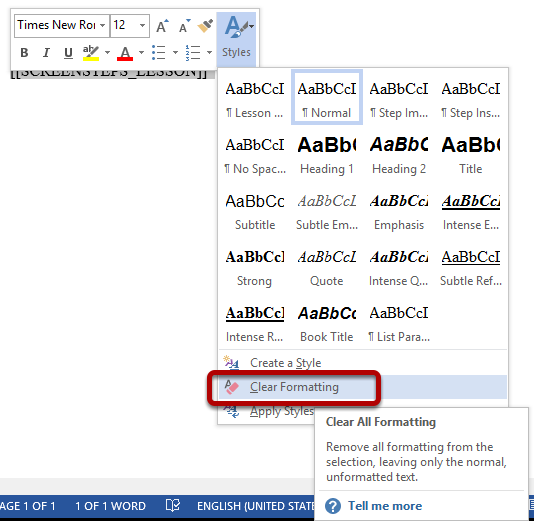 Before you click OK click on the Format menu and select Paragraph. Change the Before and After settings for Spacing. In this example I'm using 12 pt. This adds a little breathing room around step images and the step title/instructions. Click OK to save the changes. Click OK again to save the Step Image style. 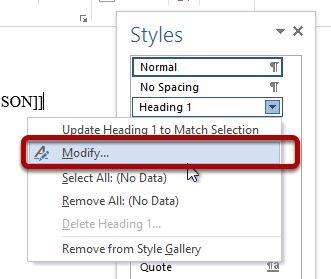 After modifying the styles in the document make sure that no styles is applied to the tag. 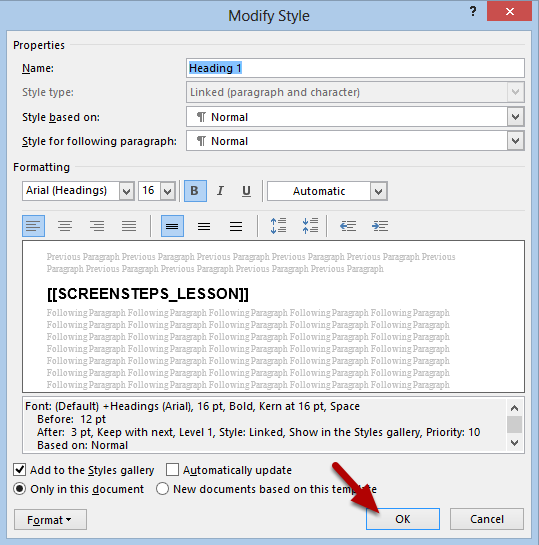 I selected the [[SCREENSTEPS_LESSON]] text and used Clear Formatting to remove any styling. 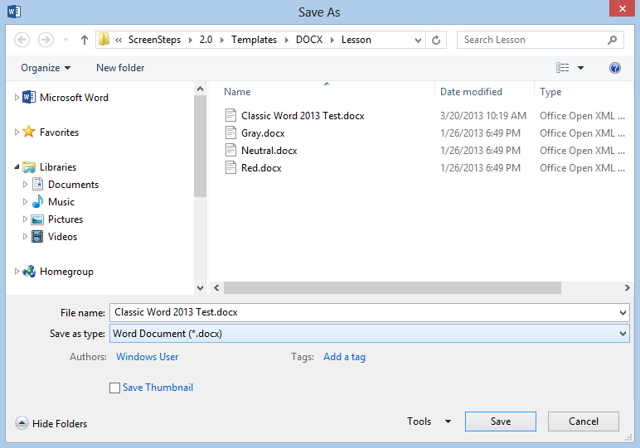 You can now save the document in the ./DOCX/Lesson folder in your Templates folder. 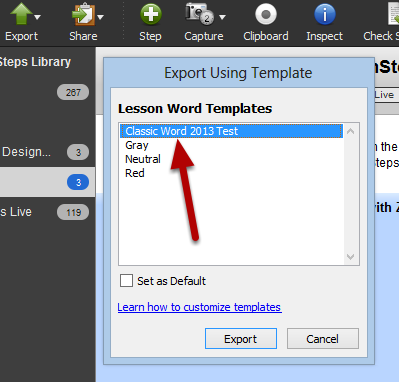 The next time you export a lesson to Word your new template will be available. Prev: Where Can I Find Word Templates? Next: How Do I Create A Manual Template? How do I position images to the right of the instructions? Can I create a title page? @paul: On the step where you "Create Step Image Style" you should be able to set the paragraph alignment to right to have your images right-aligned. We seem to have a problem with numbered lists in lessons. The first line is numbered, but the subsequent ones lose the numbering when exporting to docx. Any ideas? @Robert: I'm not sure what the cause may be. I would suggest exporting a Package of the lesson exhibiting the problem along with the resulting DOCX file and the DOCX template you are using to support at bluemangolearning dot com so we can take a look. 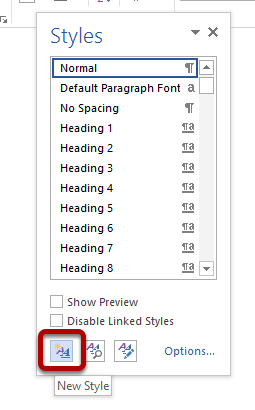 Why is the "code Style not present as style in word ? @Matthias - No particular reason. I've made a note to add this as a style in the next major upgrade. how do i remove the brackets found around my step names when I export to Word? preferably i would like them to not show up when I export. @Ryan - ScreenSteps doesn't insert brackets around anything. By chance do you "Show Bookmarks" checked in your preferences? That would show brackets around any bookmarks. 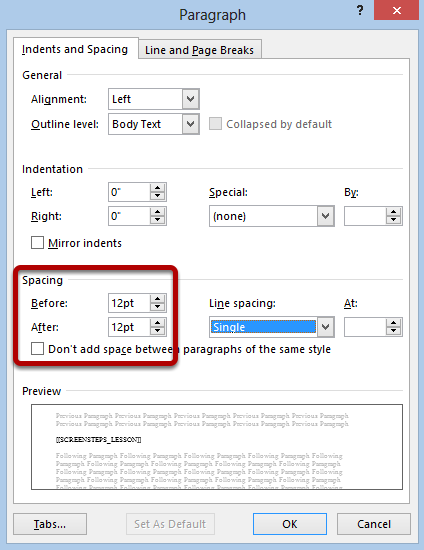 Is there a way to stop it from adding a page break before each lesson (either in Word or PDF)? @Violet - sorry, there is not. Is there a way to reorder the individual components of a step? 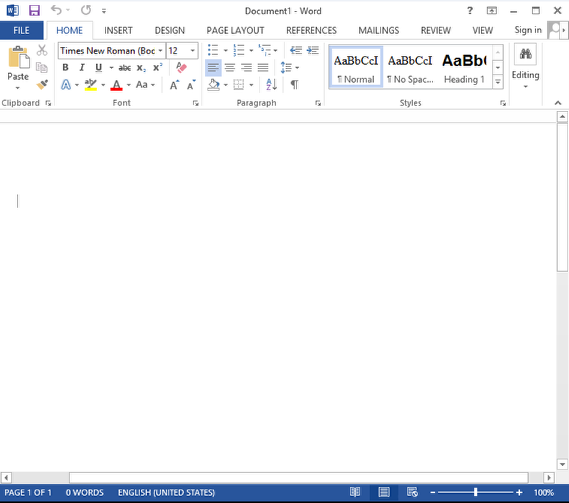 I'd like to have the step text appear above the step image in my MS Word exports. That isn't a style change per se, I realize. Just curious if that possible. Are there individual field codes that can be applied to each step component (i.e., step_title, step_image, step_text)? This would make re-orienting much easier, IMHO. @Shawn - in ScreenSteps 2 there is not. In ScreenSteps 3 (and Clarify 2 which exports to Word) you can specify whether the image appears above or below the step instructions from within the document editor. While this doesn't give you complete control, it does allow you to swap the image/text order for all output. Okay. How do I get ScreenSteps 3? I am not interested in the online collaboration features, etc. I just want the local desktop app. It seems that the only way to use ScreenSteps 3 is to pay a monthly subscription. Is this correct?